Royal Ballet: Birthday Offering, A Month in the Country and Les Noces, Royal Opera House, July 4. Sitting in the stalls is a completely different experience from being on my usual perch in the top of the upper circle. The orchestra sound is emphatically full, and there is enough light from the stage to see the notes I am scribbling without overwriting them. When the curtain opens on Sir Frederick Ashton’s Birthday Offering, I feel I am on the stage; seven couples enter the ballroom to a Glazunov waltz in a grand elliptical curve. From here they are fourteen people dancing rather than the fourteen figures dancing one sees from the upper circle. The facial expressions are clear, too, and there is one face that is not smiling during this grand opening, standing out like the proverbial sore thumb. The ellipse becomes two lines, the men behind and the women in front – the cream of the Royal Ballet’s ballerinas, please note. At least, that was the idea behind Ashton’s ballet: a party piece for the leading ballerinas to celebrate the 25th anniversary of the company, and there were seven in the original cast: Elaine Fifield, Rowena Jackson, Svetlana Beriosova, Nadia Nerina, Violetta Elvin, Beryl Grey and Margot Fonteyn. The Royal Ballet as of this evening has ten principal women, with one on maternity leave. Nine into seven doesn’t go, and Zenaida Yanowsky is dancing the lead role of the next ballet, but there are four principals missing from the present lineup (Marianella Nuñez, Alina Cojocaru, Leanne Benjamin, and Lauren Cuthbertson), three of whom one might have expected to see in this particularly show-off work. Their places are taken by three first soloists, so the whole nature of the work has shifted: the proud party piece becomes a challenging exercise without a celebratory occasion. The challenge for the dancers is not only in the steps. In creating Birthday Offering, Ashton worked closely with each of his ballerinas, moulding steps to their respective technical abilities and responding to their individual characteristics in order to show them off in their best light. It is effectively an intimate portrait of the seven ballerinas with whom Ashton worked in 1956; it is not a portrait of the seven ballerinas on stage this evening, who are dancing the portraits of the seven original ballerinas. So however well they dance the steps, they do not have the confidence that the variations are tailored for them; they can shine, but they cannot show off. After the seven couples repeat the opening mazurka, the women leave and the men walk elegantly to the back of the stage to watch the variations, the very core of this work. Yuhei Choe dances the first variation, originally created on Elaine Fifield. Choe has above all a refined, delicate quality, and an ability to turn, notably in a sequence of a quick turn to the left, then a turn to the right followed by a double. Laura Morera enters backwards on pointe to begin the second variation, created for Rowena Jackson, a vivacious and smiling performance, bright and fast. Sarah Lamb assimilates the qualities of Svetlana Beriosova in a generous offering of beats, balance and renversé turns ending with the lovely, expansive gesture of offering to the audience. Roberta Marquez, who stood out in the opening for her dynamic épaulement, is full of exuberance, shining in the spirit of Nadia Nerina’s fourth variation with ease and warmth. She finishes the variation calmly in arabesque. Hikaru Kobayashi has control over some difficult adage steps in Violetta Elvin’s tricky fifth variation, but lacks sufficient juice this evening to mould them together seamlessly. I sense Helen Crawford has an affinity with the spirit of Beryl Grey’s pizzicato variation: she has a strong, dramatic quality, a quiet jump, and executes the piqués and difficult beating steps brilliantly. The men now disappear, signaling the arrival of the ballerina of the ballerinas, Tamara Rojo, who bourrées in like a doll – a teasing reference by Ashton, according to Zoe Anderson’s program notes, to Margot Fonteyn’s weak feet. Rojo has the assurance of the prima ballerina, but is quite business-like, generous but constantly monitoring her own performance. We know if she is doing well, and we also know if she knows she is doing well. She takes an expansive bow and looks back at the audience as she walks off, her last classical variation for the Royal Ballet. The men reemerge in a mazurka, with Federico Bonelli taking the lead once danced by Michael Soames. He is barely stretched by the series of double tours, pirouettes and beats. In the grand pas de deux – a presentation within a presentation – Bonelli and Rojo begin with a shaky, almost nervous grip. The violin must have caught the same chill for one brief moment. Bonelli partners Rojo in barely supported bourrées on a diagonal. She has a perfect poise and balance, but looks this evening as if she is working at it, so the overall impression is not as open as one would like. To the final music, the ballerinas arrive with their respective partners, first Choe and Morera, then Kobayashi and Marquez, Lamb and Crawford. Rojo enters on her own path from the back, like an entrance from one of the classic ballets, and joins Bonelli and the other six couples for a grand, smiling finale. When the curtain opens on Ashton’s adaptation of Ivan Turgenev’s play, A Month in the Country, Julia Trevelyan Oman’s wonderfully detailed period design, lit beautifully by William Bundy, sweeps us instantly, actively into the Yslaev home; the choreography has started before anyone has made a move (the effect is the same with Oman’s design for Enigma Variations). A footman (Sander Blommaert) serves drinks. On stage right, Natalia Petrovna’s husband, Yslaev (Christopher Saunders), is sitting in a chair reading a newspaper, and their son, Kolya (Ludovic Ondiviela), is sitting writing at a desk behind his father. On stage left, Petrovna’s admirer, Rakitin (Gary Avis), is lounging on a divan at her feet engaging her in idle conversation, and the Yslaev ward, Vera (Emma Maguire), is at the piano in an alcove. The music is by Chopin, admirably played throughout by Kate Shipway in the orchestra pit. As we look at the stage, the active protagonists of the story are on the right, and the passive victims on the left. All the introductions are made in those first moments and the scene is set: provincial life at the country house, languid, slightly bored. The maid (Sian Murphy) enters, and curtsies. She invites Yslaev out into the garden. He crosses the room to give his wife a kiss on the forehead and leaves by the patio doors at the back of the room. Petrovna (Zenaida Yanowsky) gets up from her divan impatiently, unable to contain her emotions, launching into a spirited, lyrical dance that is both flirtatious and sensual. Rakitin, unsettled and unsure of the source of her unfamiliar emotion, tries to forestall it by taking her hand and kissing it, bringing the dance to its conclusion. It is now Vera’s turn to dance her own emotions on the same musical variation, a young girl with huge spirits, on the verge of womanhood, with dreams of love. Maguire, who looks the part, and for whom the role seems tailored, expresses it all with natural grace and joie de vivre. Kolya watches her until she finishes sitting in Yslaev’s empty chair, dreaming, perhaps, of being mistress of her own house one day. Yslaev returns, fussing over having lost something. Everyone starts looking for whatever it is, roused by the physical contact, bumping into each other, stepping over Kolya who is on all fours, lifting each other out of the way. It is like a delightful game to relieve the building tensions. Only Petrovna and Rakitin seem uninterested but they soon join in and it is Petrovna who locates the keys and Yslaev leaves once again. Kolya lets off steam, his boyish sense of fun expressed in a playful dance, juggling and bouncing a ball. The lace curtains flutter in the breeze as a premonition of the storm about to burst on the family: the entrance of the new tutor. Beliaev (Rupert Pennefather) appears at the open door with a kite he has built for Kolya. He is tall and elegant, with blonde hair and a moustache, but looks as if he has been over-exerting himself with the kite, as there is a weariness in his face and in his demeanour. He salutes Petrovna, Vera blushes, and Rakitin, who is still trying to piece together the puzzle of Petrovna’s recent capricious humours, eyes him with disdain. Petrovna engages Beliaev in conversation and the latter responds with dance language that has all the suppleness and romance that Rakitin lacks. The arabesque is used to beautiful effect, a purity of line emerging from the surrounding turmoil. Petrovna does not watch but notices every nuance. Rakitin leaves abruptly on some pretext, leaving Petrovna and Beliaev to dance together to a polonaise, evidently cherishing the moment. Vera comes in and immediately joins in the dance with Beliaev, while Petrovna disengages, collects herself and observes Vera’s innocent love bubbling over. Kolya joins in, making everyone laugh, and all four dance together, searching for the relationship each craves. Beliaev shows off in the heat of embarrassment and attention, while Petrovna is carried away by her feelings. All but Petrovna leave, and the applause is well deserved not only for the performance of the four characters, but for the clarity and emotional power of the choreography. Rakitin returns, sees Petrovna alone in a flush of emotion and checks to see if the tutor is anywhere nearby. He takes her shoulders from behind, a gesture Petrovna misinterprets as that of the returning Beliaev. Her reaction encourages Rakitin to continue his amorous pursuit and to share in her aroused state, but once she realizes her mistake, she will have none of it. She goes through the movements, but without a trace of passion. She breaks off. Rakitin stubbornly or perhaps desperately redoubles his efforts, frustrating Petrovna more. On hearing the footsteps of Yslaev they break apart, but entering the room, Yslaev sees his wife out of sorts and wonders what is wrong. Rakitin reassures him it is nothing and escorts Yslaev into the garden. Petrovna leaves and Kolya, the one who is innocently unaware of the storm descending, runs in from the garden and rushes around the room with his kite and out again into the air, a beautifully eloquent choreographic moment. Vera arrives, evidently in love, and Beliaev, noticing Vera, quickly checks to see if Petrovna is around. Vera offers herself to him for a kiss. Dancing together, Beliaev tries to keep her occupied and happy, going through the actions as Petrovna had just done with Rakitin, but Vera sees his involvement as acquiescence to her wish. As the duet becomes more entwined, we know Petrovna is going to arrive at any minute. Vera gives Beliaev a hug, and he puts his arms tentatively around her. Petrovna sees this as she enters in a serious, overwrought, dramatic state. She lectures Vera, but Vera is naive, and head over heels in love. She admits to Petrovna her love for Beliaev, kneeling in front of her and crying on her lap. Maguire’s emotional power here is utterly convincing, bringing tears to my eyes. Petrovna, however, is moved differently; she is aghast, and slaps Vera’s face. Vera runs out into Rakitin, who is clearly reeling from the events that have overtaken his tranquil, if slightly unusual way of life. Have some tea dear, no come for a walk, he seems to say to Petrovna: anything to get her out of the house. They step together – the Fred step – out into the garden. Beliaev appears, clearly exhausted. He sees Rakitin and Petrovna walking arm in arm in the garden, and sits in Yslaev’s seat, musing on his fate. Another complication is about to arrive in the form of the maid, Katia, with a basket of raspberries. We see her outside the window with the footman, who thinks he is on to a good thing, but once she sees Beliaev, the maid pushes the footman away and rushes to flirt with the tutor, feeding him raspberries one by one. They dance together, in more peasant mode, to a polonaise. Sian Murphy is ecstatic and shows it. Without any unwelcome interruptions, the dance finishes; she picks up her basket of raspberries and runs off, leaving a pensive tutor to dance his heartache, beautifully expressed in his body and arm movements. Petrovna arrives, unseen. She approaches Beliaev and pins a rose to his tunic, then backs away as if to leave. Now it is Beliaev who takes her hand to stop her. This is the beginning of their duet to the Andante spiniato, all emotion and interlocking arms, hands searching each other’s bodies, lifts with opening legs and skirt flying, elongated lines and willing submission. She melts in his embrace. She pulls away; she goes to kiss him, then changes her mind again and runs to the garden door. He stops her, gently bringing her back into the room in a series of gliding bourrées on shallow diagonals down stage. She responds and they embrace, his head resting lovingly on her chest when Vera rushes in and the dénouement begins, to Chopin’s Grande Polonaise. Ashton’s choreographic action follows the structural pattern of the play: short lines of dialogue, full of detail. The only long passages are Beliaev’s four pas de deux with Petrovna, Vera and Katia. Ashton has cut from the play any characters and situations that are not essential for the telling of the story, and that cannot be translated clearly into choreographic language. Oman’s design and the music of Chopin complete this unity to perfection. Bronislava Nijinska’s choreographic setting of Stravinsky’s Les Noces closes the program. 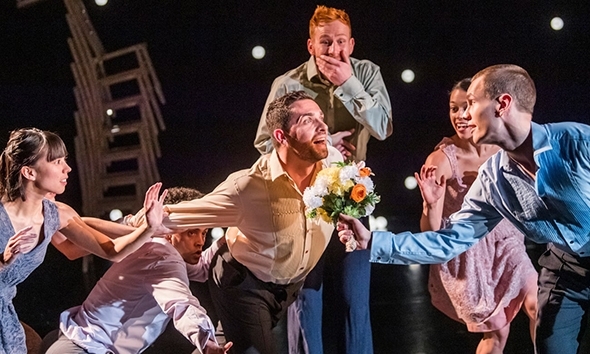 Created in 1923 for Diaghilev’s company, the abstract, ritual wedding festivities make for a stark and rather incongruous contrast to A Month in the Country, but Les Noces is, in its own right, a powerful work. Its geometric construction and grounded, massed choreographic language, as well as its percussive score, make it unique in the ballet repertory. It is also an unemotional work for those dancing: Nijinska did not want expressive faces, but expressive body shapes, and the power of the work derives from the ensemble working rigorously and harmoniously together. The designs of Natalia Goncharova are simplified, abstracted architecture that serve to enhance the primitive rituals of the four tableaux: Consecration of the Bride, Consecration of the Bridegroom, Departure of the Bride, and the Wedding Feast. Ryoichi Hirano is the stoic bridegroom, and Christina Arestis as the bride has just the right enigmatic look that seems to convey the mystery and fear of what she experiences, without attempting to express it. Indeed, there is no room for personal expression apart from Nijinska’s calculated movement. There are some weaknesses in the performance. In the second tableau, none of the men seem quite sure where to look, so their ensemble work lacks its maximum force. There is also an unevenness in the men’s physical engagement with the grounded leaps: to keep on the music, the form in the air is sometimes incomplete, and the dynamics not sufficiently brutal to convey the primitive nature of the ceremony. There is one curly-haired dancer – I wish I could identify him – who is clearly giving it his all, and is a pleasure to see. Les Noces is a work that demands such total concentration and dedication from everyone. The third tableau is beautiful, and during the fourth the ensemble really begins to work as one, finishing the work on a magical high.